DevoHub – You probably haven’t heard about this new online tool from LifeWay. DevoHub has a free app in the iOS and Google Play stores that can be downloaded to your smartphone. When a church subscribes to the DevoHub service, it can set up an activation zone around the church. Once on campus, members and guests can activate their daily devotionals just once using the free DevoHub app and receive daily devotionals as long as the church is a subscribing member. There are daily devotional options for men (Stand Firm), women (Journey), kids, students, and families. There are also versions for all adults (Open Windows, Renew Daily). Plus there is a Spanish option, Quietud. You can get a free trial subscription by visiting devohub.com. Explore the Bible – This ongoing Bible study by LifeWay seeks to help people explore Scripture a book of the Bible at a time. Over the course of 9 years, all 66 books of the Bible are studied. Because it is impossible to study every verse in 9 years (it would actually take just over 40 years to study every verse in the Bible! ), the team that creates Explore the Bible has placed a daily reading schedule at the front of each Personal Study Guide (PSG). Although the weekly Bible studies cannot touch on every verse in a book, the daily reading plan does. This is a great way to bring affordable devotional reading options to church members and guests through their ongoing Bible study materials! Discipleship In Context – Another option for creating devotionals for your church members is to choose a customized option. LifeWay has a new resource Discipleship In Context. This highly talented team of people create customized content based on a church’s needs. 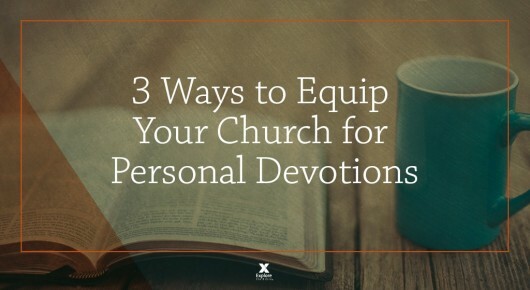 Devotionals can be crafted to coincide with the pastor’s sermons or any other criteria. You can learn more at discipleshipincontext.com.